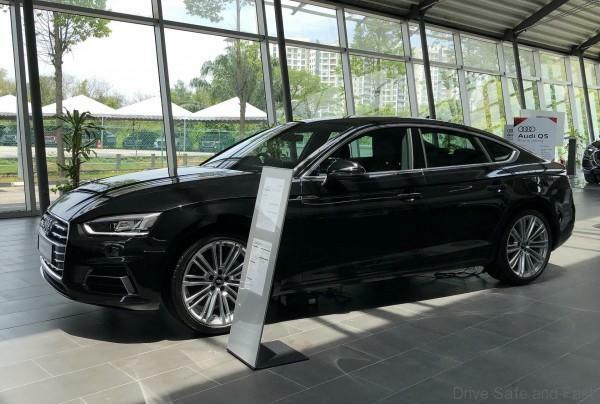 Meet the all new Audi A5 Sportback. 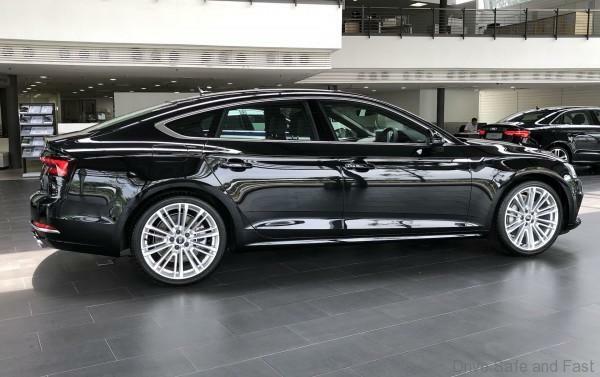 Thisfive-door coupé blends elegant, emotional design with high functionality andabundant interior comfort. 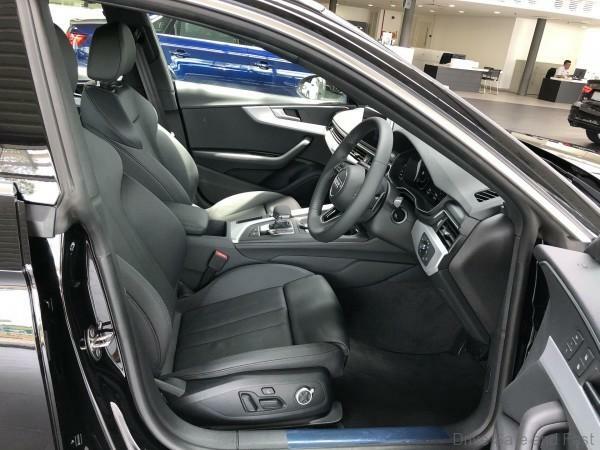 The family-friendly car is perfectly connected andoffers the latest infotainment features. Plus, this second generation comeswith a completely reengineered suspension, high-performance drives andinnovative driver assistance systems. 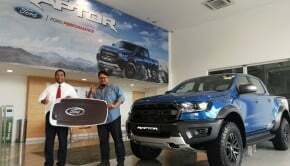 So why do we say just RM338,878. Well, letus explain. 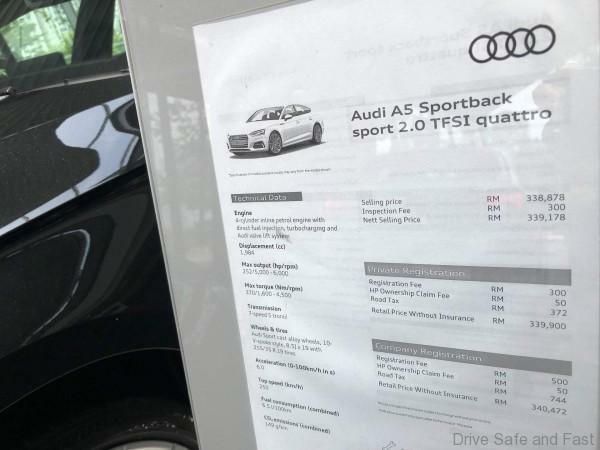 It is a 2.0 TFSI with a Quattro drivetrain (this means 4-wheeldrive) and it is fully imported. 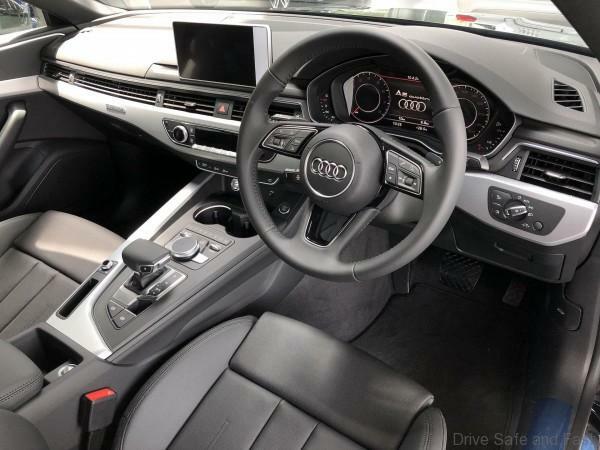 The 2.0 TFSI produces 252hp with 370Nm oftorque is available between 1,600 and 4,500 rpm. 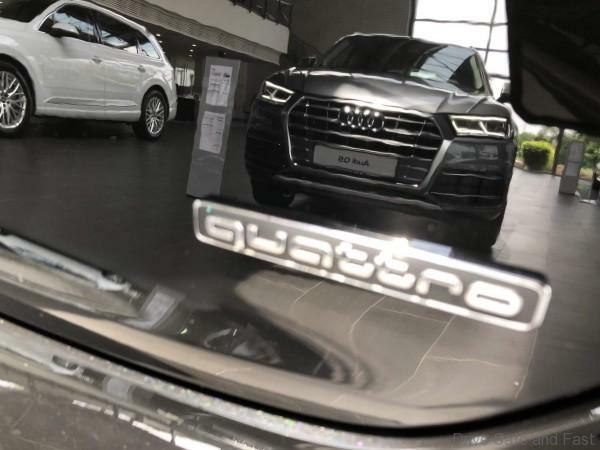 With quattro all-wheel drive,it sprints from 0 to 100 km/h in 6.0 seconds on its way to an electronicallylimited top speed of 250 km/h. 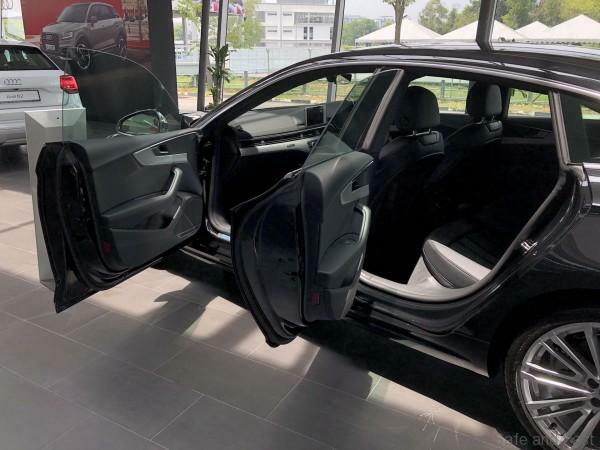 Its nearest rival is the 2.0L BMW 630i GT which is local assembled at RM450,000 with rear wheel drive. The 2.0-litre 4-cylinder petrol engine delivers a maximum output of 258hp and peak torque of 400Nm. 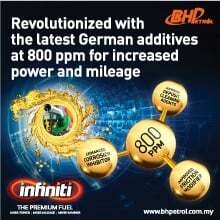 The car has a top speed of 250km/h while optimising fuel economy. It sprints from 0 to 100 km/h in 6.3 seconds. 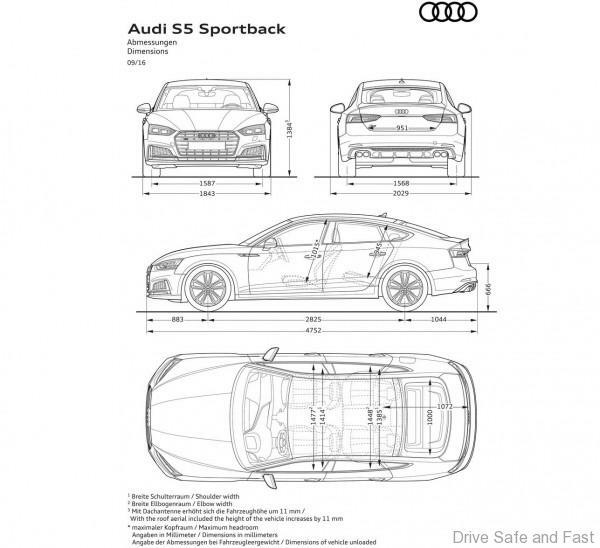 4,733 millimeters (186.3 in) in length, a2,824 millimeter (111.2 in) wheelbase, 1,843 millimeters (72.6 mm) wide and1,386 millimeters (54.6 in) high – the new Audi A5 Sportback displays sporty,balanced proportions. 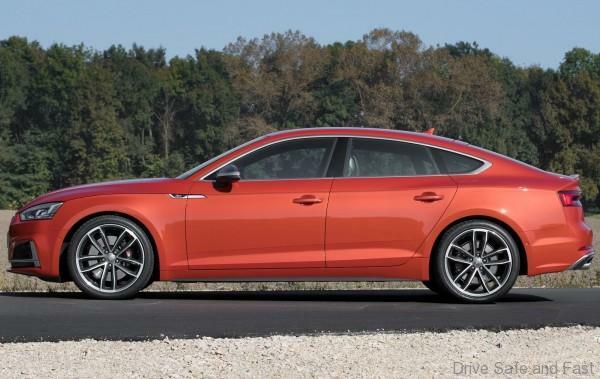 Audi’s designers have combined dramatic shapes andathletically taut surfaces in the design of the five-door coupé. 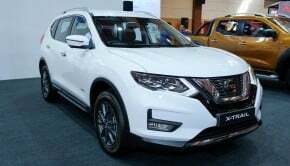 The stretchedwheelbase, the short overhangs and the long, wraparound front lid with powerdome emphasize the model’s dynamism. 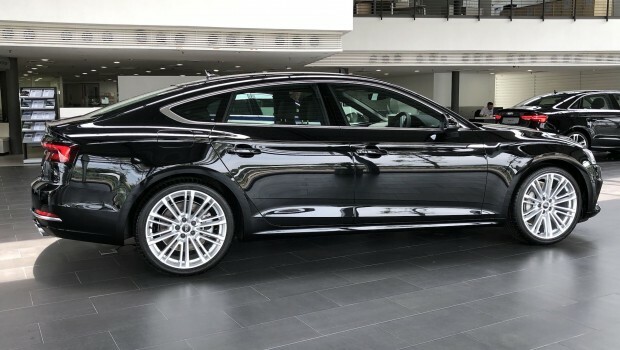 Another distinguishing feature of the newA5 Sportback is the sporty front end. 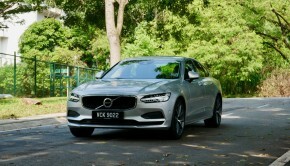 The three-dimensionally modeledSingleframe grille is significantly flatter and wider than on the previousmodel. Depending on specification, the radiator grille comes in subtle blackmatt. 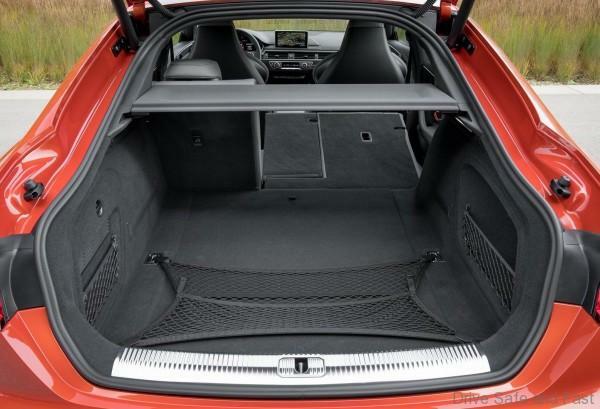 On the sport trim line its basic color is twilight gray matt withhorizontal slats in aluminum silver matt. In the design trim line it is inelegant dark titanium black with horizontal slats in chrome. 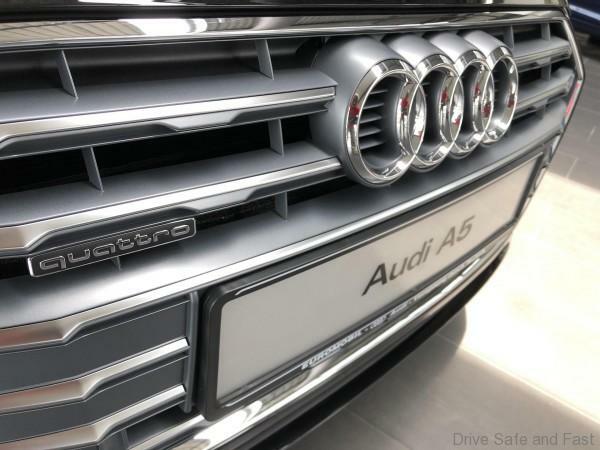 The side airintakes have bold edges and optionally – with the S line exterior package –honeycomb grilles and a sporty, horizontal trim strip in aluminum silver mattextending across the entire front end. 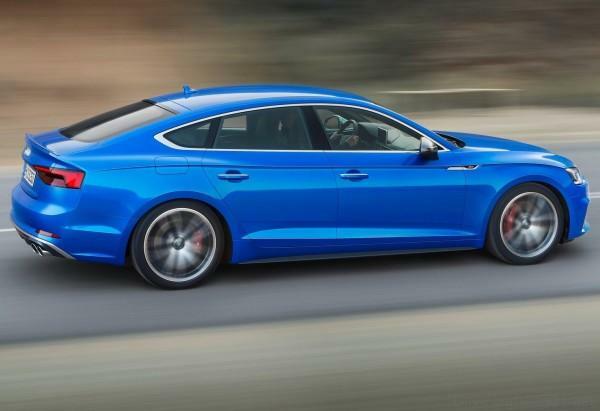 The wave-pattern shoulder line imparts theAudi A5 Sportback with emotional elegance. The characteristic design feature,already present on the previous model, is now even more striking with itsthree-dimensional character. The interplay of light and shadow becomes all themore alluring. The long sweeping wave with the pronounced bulges over the wheelarches underscores the quattro DNA. 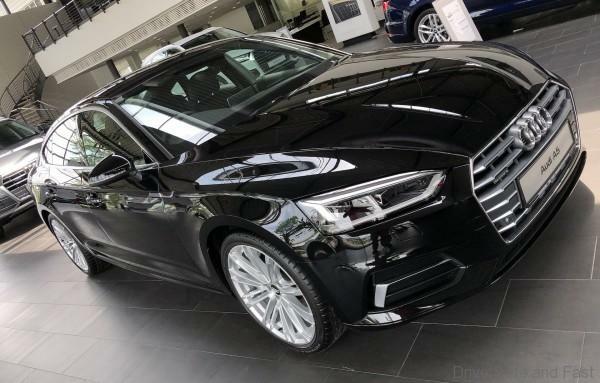 At the transition from the front wheelarches to the doors, a three-dimensional chrome trim element highlights thesporty ambitions of the new A5. From the A-pillar, which has been shifted farto the rear, the roof extends over the athletic body with its frameless doorsas a flat, flowing dome. The front and rear side windows are given emphasis bya trim strip in aluminum silver, matt. The rear end exhibits clearly horizontaland three-dimensional styling. The stretched luggage compartment lid inaluminum terminates with a striking spoiler edge that also enhances theaerodynamics. Separate reflectors in the lower section of the rear apron, whichis painted in the body color, emphasize the width. The slim, three-dimensionally shaped rearlights come in LED technology as standard, and an LED lighting signatureunderlines their sculptural geometry. 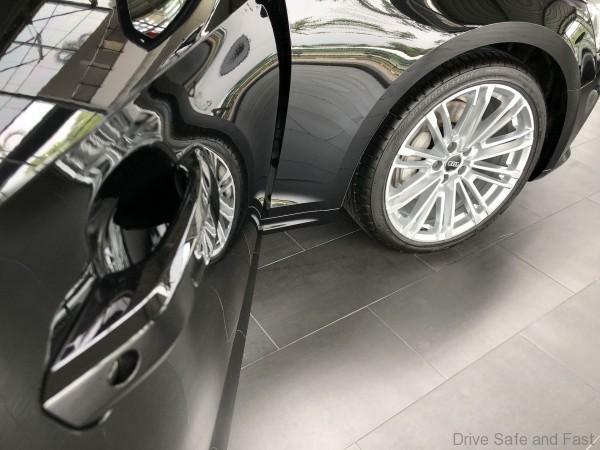 The delicate brake light sits below theluminaries, and the dynamic turn signal (with LED headlights and higher) formsa precise strip in the upper section. The third delicate brake light on theupper edge of the rear window spans its entire width. 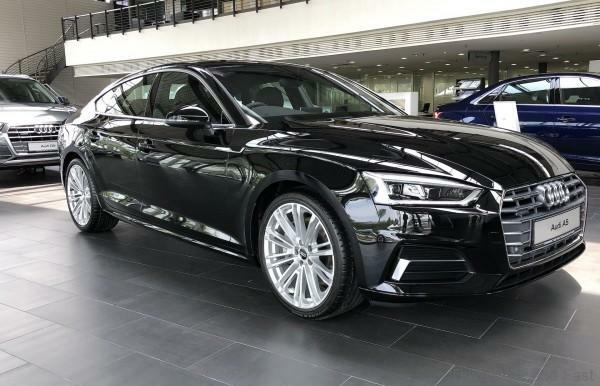 The finely contoured headlights in the newAudi A5 Sportback harmonize perfectly with the horizontal lines of the frontend. 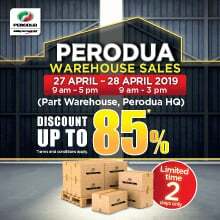 They are positioned slightly above the top edge of the Singleframe grille,which is drawn down quite far – a surprising design detail and a first in theA5 model line. LED technology is used for all lighting functions. The newlighting signature of the Audi Matrix LED headlights creates a characteristic,focused four-eye face reminiscent of the Ur-quattro. 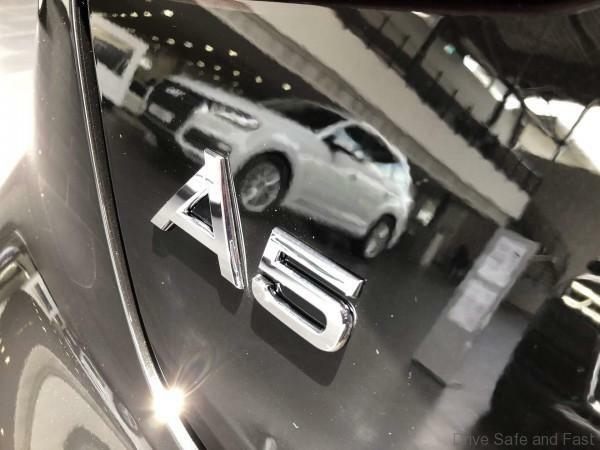 The new A5 Sportback offers perfect buildquality and optimum practical utility. The ambient lighting with 30 selectablecolors provides scope for creating a fitting mood for the high-qualitymaterials. The horizontal architecture of the instrument panel creates a senseof spaciousness. 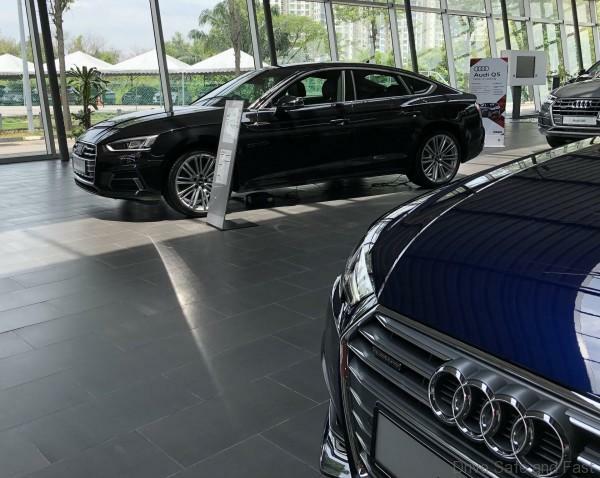 The new A5 has grown in virtually alldimensions. The interior has gained17 millimeters (0.7 in) in length. Theshoulder room has also been increased for both the driver (plus ninemillimeters (0.4 in)) and the front passenger (plus eleven millimeters (0.4in)). 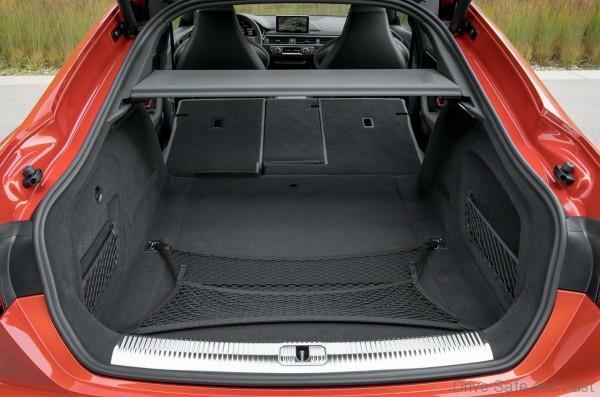 Knee room in the back has even increased by 24 millimeters (0.9 in). The rear seat back splits 40:20:40 asstandard. The load-area width measures exactly one meter (3.3 ft). 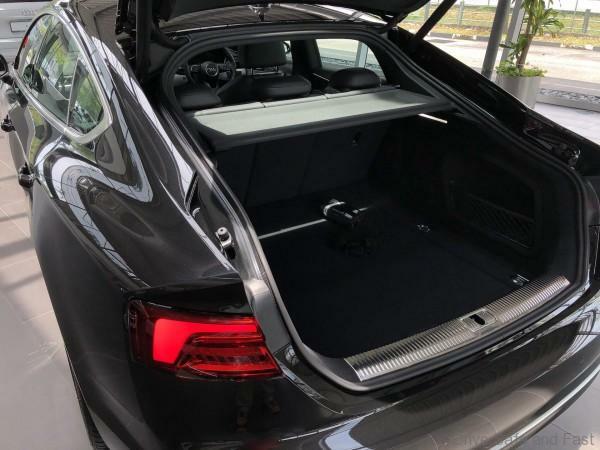 Therectangular-shaped layout of the 480-liter (17.0 cu ft) luggage compartmentmakes it outstanding in terms of practical use. 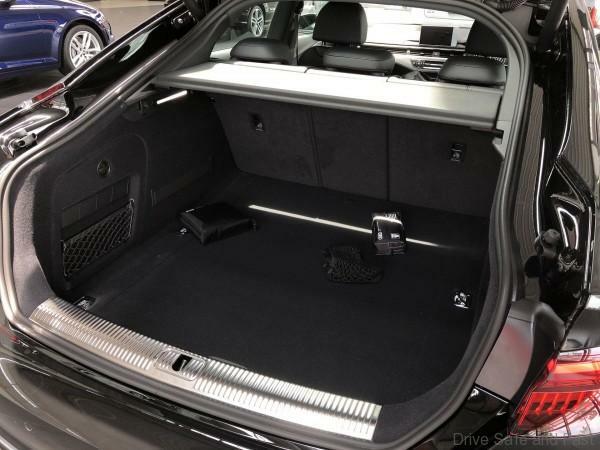 With the rear seats foldeddown, it can even accommodate 1,300 liters (45.9 cu ft). 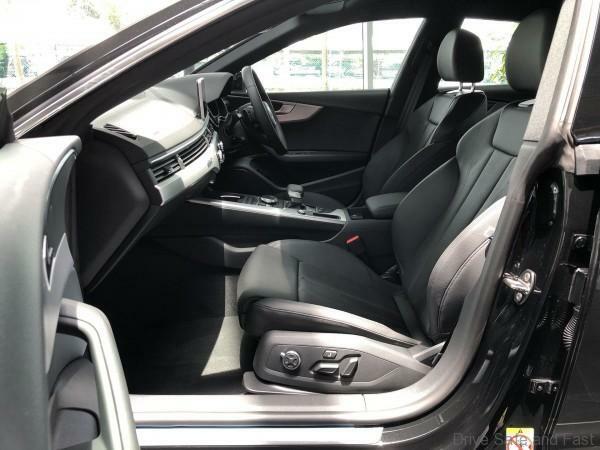 Inside, the A5 Sportback features whiteLEDs as standard. The driver can operate the reading lights via sensors. Atnight, the interior lighting package or the ambient lighting are optional waysof setting accents. The latter changes the lighting color, with a choice of 30hues. This can also be linked to the mode selected in Audi drive select. SlimLED light guides in the door trims create highly effective contours. Choice materials and colors emphasize thegenerous dimensions and elegance of the interior. There is a wide range of newcolors and combinations to choose from in the sport and design trimlines, andin the S line and design selection packages. They afford plenty of scope forcustomization. Besides black, the instrument panel can be divided into twocolor zones with the design trim line: a dark upper area and a light lowerzone. 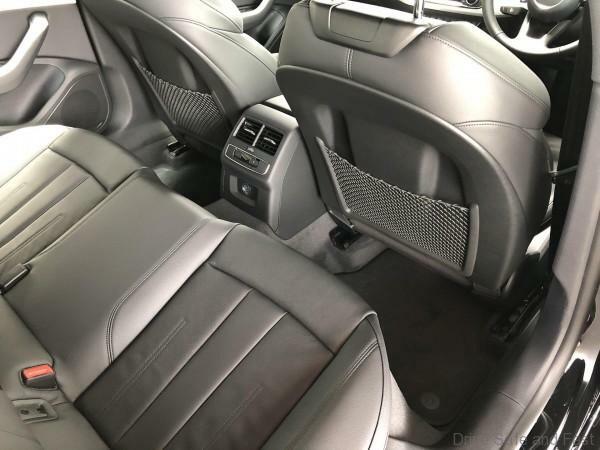 The colors of the lower zone of the instrument panel are repeated in theseat upholstery. 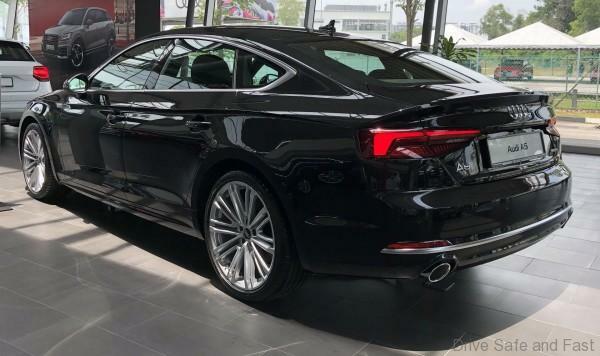 A continuous air vent strip and theplunging center console underscore the impression of a floating instrumentpanel in the new Audi A5 Sportback. 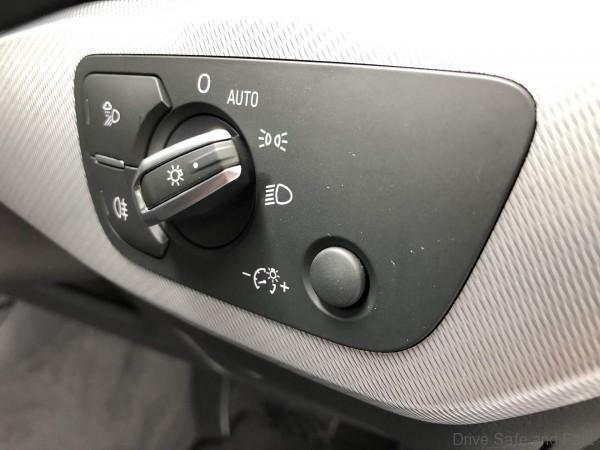 The control panel of the automatic airconditioning is another highlight, particularly with the optional deluxeautomatic air conditioning, which has the digital temperature displaysintegrated into the control dials. Just a few buttons and dials are sufficientfor convenient control. When a finger approaches one of the rocker switches,the function is shown enlarged on the dark LCD display and selected at the pushof a button. 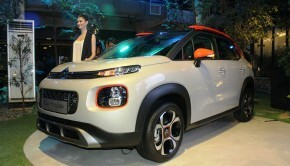 Both the standard single-zone system andthe triple-zone deluxe automatic air conditioning have been completelyredesigned. Both systems have low energy consumption. They also provideextremely high air quality: In both fresh air and recirculating operation, anactive-carbon combination filter removes the finest particulate matter. 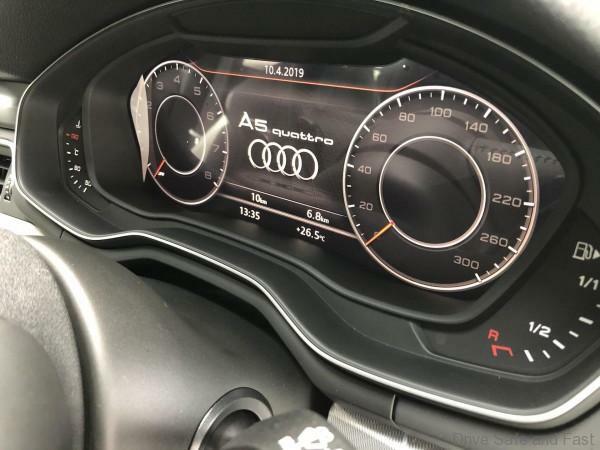 The new Audi A5 Sportback has a large,easy-to-read analog speedometer and tachometer as standard. Between them is thedisplay of the driver information system (DIS). In the basic version, the DISmonitor has a 5-inch screen diagonal. 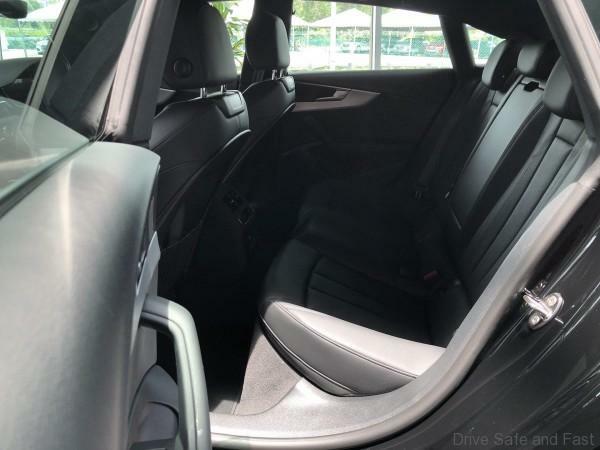 The color Audi MMI display in the centerconsole measures 7 inches. MMI navigation plus (and Audi design selection)bring a color 7-inch driver information system and an 8.3-inch Audi MMI displayon board. The MMI system is controlled via thecontrol elements on the wide, asymmetrically split center console. The focalpoint of the terminal is the round rotary pushbutton. Its surface is home tothe touch-sensitive touchpad option. The touchpad is used to input charactersand also for multifinger gestures, enabling the driver to zoom in on the map,for example. The whole MMI control logic is similar to that of a smartphone,including the intelligent free text search function. 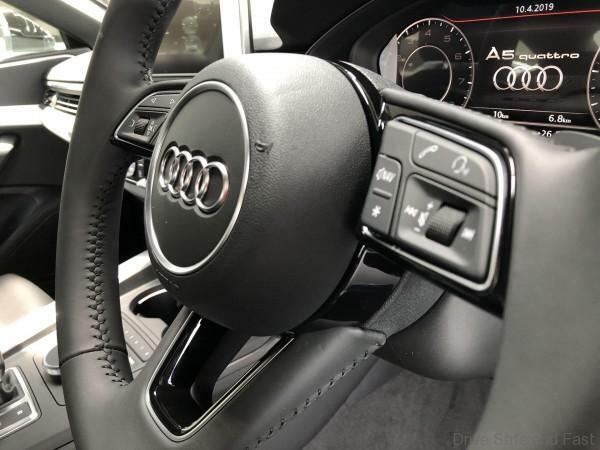 The Audi virtual cockpit is an alternativeto the analog instrument dials for the new A5 Sportback. It assumes that MMInavigation plus with MMI touch is on board. The various display options bringthe driver added convenience. Thanks to its resolution of 1,440 x 540 pixels,the large (12.3 inch) TFT monitor displays richly detailed graphics. The head-up display projects all relevantinformation onto the windscreen as easily comprehensible symbols and digits,minimizing driver distraction. The information appears to hover around twometers (6.6 ft) in front of the driver within a window area measuring 200 x 80mm (7.9 x 3.1 in). The human eye registers the information extremely quickly –there’s no need to switch from the accustomed long-range vision. Audi’s top version is MMI navigation pluswith MMI touch. 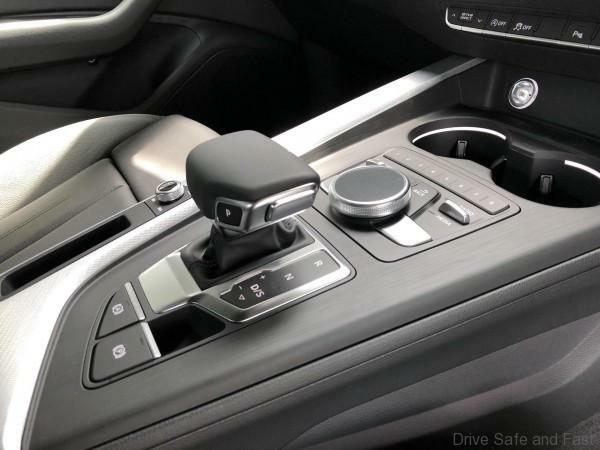 In addition to the Audi MMI navigation features, it includes 10GB of flash storage, a DVD drive, Audi connect services for three years, up tofive free navigation updates (available at six-month intervals) and an 8.3-inchmonitor with a resolution of 1,024 x 480 pixels. Audi MMI navigation plus worksin close cooperation with many of the assistance and safety systems.